Pope Marinus II (or Martin III; died May 946), was Pope from 30 October 942 to his death in 946. 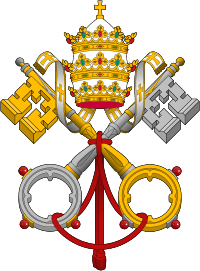 Marinus was born in Rome, and prior to becoming pope he was attached to the Church of Saint Cyriacus in the Baths of Diocletian. He was said to have encountered St. Ulrich on his visit to Rome in 909, and reportedly predicted Ulrich’s eventual appointment as Bishop of Augsburg after the devastation of the Hungarian invasion. 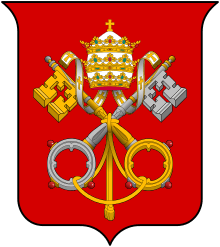 Marinus was elevated to the papacy on 30 October 942 through intervention of Alberic II of Spoleto, Prince of the Romans, and concentrated on administrative aspects of the papacy, and sought to reform both the secular and regular clergy. He extended the appointment of Frederick, Archbishop of Mainz as Papal Vicar and Missus dominicus throughout Germany and Francia. Marinus later intervened when the Bishop of Capua seized without authorization a church which had been given to the local Benedictine monks. In fact, throughout his pontificate, Marinus favoured various monasteries, issuing a number of Papal bulls in their favour. Marinus occupied the palace built by Pope John VII atop the Palatine Hill in the ruins of the Domus Gaiana. He died in May 946 and was succeeded by Agapetus II. Chisholm, Hugh, ed. (1911). "Marinus". Encyclopædia Britannica. 17 (11th ed.). Cambridge University Press. p. 722.